One day a rich young Uzbeki merchant came into Tulla’s shop to buy some of his pottery. The merchant’s name was Izzat Baig. 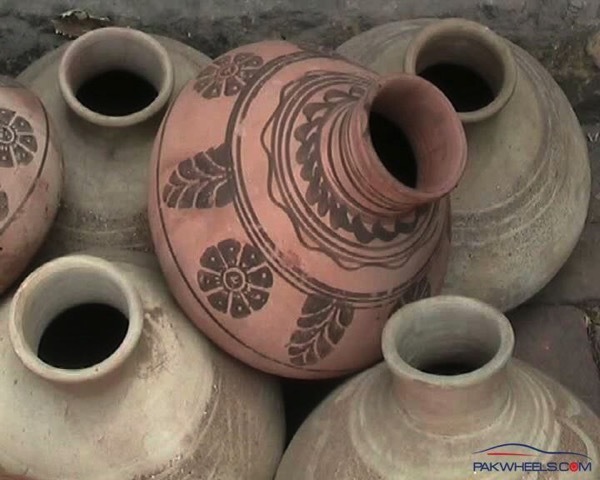 Sohni was in the back of the workshop at the time, painting her designs on her father’s pots. Of course, she caught Izzat Baig’s eye. And since the merchant was not only rich, but young and handsome, I imagine he caught her eye too. Izzat wandered around the workshop much longer than he had intended, sneaking glances at Sohni, and bought many more pieces of pottery than he had planned to. And he came back the next day, and the day after that…. The caravan that Izzat Baig was traveling with left Gujrat after a few days, but Izzat Baig didn’t leave with it. Instead he stayed, and every day he came into Tulla’s shop to buy more pottery and to see Sohni. Eventually, he ran out of money, and had earn a living doing odd jobs around the area. His main job was to herd water buffalo, and so soon he became known around the region as Mahiwal, meaning buffalo herder. He and Sohni still managed to sneak away to see each other, as often as they could. Eventually, of course, Sohni’s parents found out. Such an affair was unacceptable — after all Mahiwal wasn’t just a buffalo herder, he was a foreigner, too. So Tulla and his wife quickly arranged for Sohni to be married off to a distant family member, who was also a potter. Mahiwal was heartbroken. He withdrew from life and became a hermit, eventually building himself little hut across the river from the house where Sohni lived with her husband’s family. Sohni was still in love with Mahiwal, too. At night, when it was dark and everyone in the house was sleeping, she would sneak out to meet Mahiwal by the river, where he would wait by a fire, roasting a fish that he had caught for the two of them. One night, Mahiwal couldn’t catch a fish, and so he cut out a piece of his own thigh and roasted it instead! Not only did this make Sohni cry when she discovered what he had done for her, but Mahiwal was now too injured to swim across the river to meet her. But Sohni had a brilliant idea. She would swim out to Mahiwal instead, with the help of a large gharra, or clay water pitcher, which she put upside down in the water to float her across. This could have gone on forever, but Sohni’s sister-in-law got suspicious, and started spying on Sohni. She followed Sohni to the river one night, and saw her take a large gharra from a hiding place in the bushes, then float out to the other side of the river. The next day, the sister-in-law took the gharra from Sohni’s hiding place, and replaced it with another one, which hadn’t yet been fired. That night was dark and stormy, but Sohni snuck out for her rendezvous anyway. She set out on the river as usual, but because the pitcher was unbaked, it absorbed the water and got soft. By the time Sohni was halfway across the river the gharra was melting, and Sohni began to sink. She cried out to Mahiwal, who ran out and jumped in the river to save her. But the night was stormy, the water was rough, and he was still injured. He managed to reach Sohni, but he wasn’t strong enough to pull her out. And so they both drowned, in each other’s arms. Together at last. 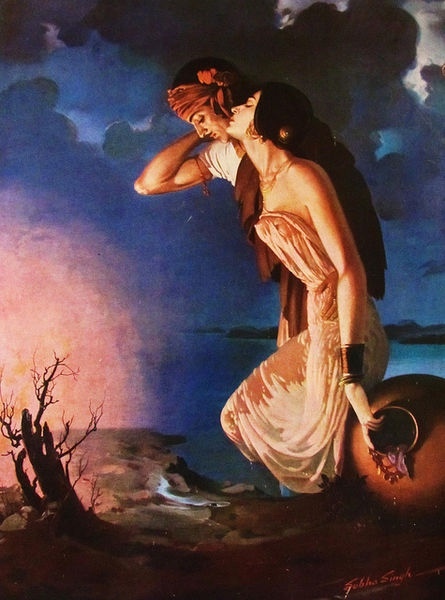 Top image: Painting of Sohni Mahiwal by Sobha Singh. Sourced from Wikipedia. 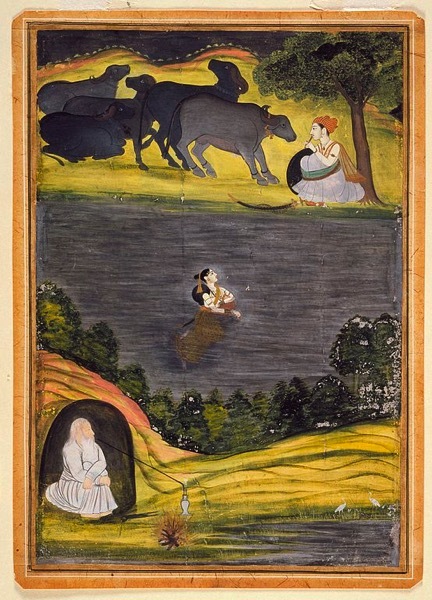 Painting Sohni Swims to Meet Her Lover Mahinwal, in the style of Faqir Ullah Khan, circa 1780. Sourced from Wikipedia.